On October 21st, 2015 the world celebrated the 30th anniversary of Back To The Future, a film which captured the hearts of movie lovers everywhere in 1985. This historic date also corresponds to the day in the 1989 sequel that the DeLorean made it’s way to the future of 2015, a future we are now living in. The time traveling escapades of Dr. Emmett Brown and Marty McFly filled our hearts with wonder for 3 films, so it’s no wonder that many people found unique ways to celebrate the occasion. What follows are some of the best ways the event was commemorated. In Back To The Future Part II, the initial reason for traveling to 2015 was to prevent Marty’s son from appearing on the front page of USA Today after being arrested for theft. As part of the Back To The Future Day celebration, the publication decided to fulfill the prediction of the film by replicating exact front page for it’s October 21st, 2015 issue. 1) Everyone who got a copy now has a movie replica item in their possession 2) This is the ultimate act of breaking through the barrier between reality and fiction. We have all now all become a part of the Back To The Future film universe. Fans of the film have dreamed for years of seeing Michael J. Fox and Christopher Lloyd reprise their iconic roles together and the dream became reality on the 10/21/2015 episode of Jimmy Kimmel Live! talk show. In a cacophany of smoke and strobe lights the Mr. Fusion fueled DeLorean arrived on stage to interrupt the host’s monologue. As the gull-wing doors opened, Doc Brown and Marty McFly emerged and were met with a 2 minute long standing ovation then began making observations about the year 2015. 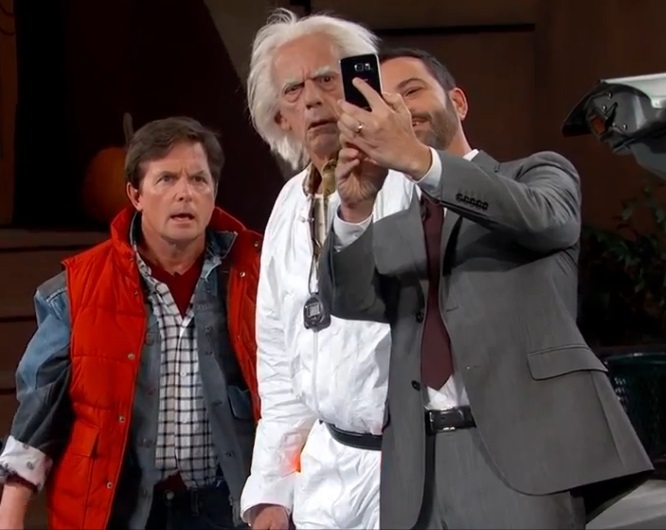 The most memorable moment involved the pair taking a a selfie photo with Jimmy using his Smartphone, a device that was not a part of the predictions for the future presented in the movies. Though the actors didn’t have quite the same chemistry of years past, it still warmed our hearts to see them together one more time. Though we have an entire trilogy of movies to enjoy, there have always been some unanswered questions in the Back To The Future universe. One of the biggest is how did a rock n’ rolling teenager become the best friend of an eccentric 60 year old scientist? After 30 years the original writer of the films, Bob Gale, has revealed the story of “How Emmet Met Marty” in a comic book from IDW Publishing. 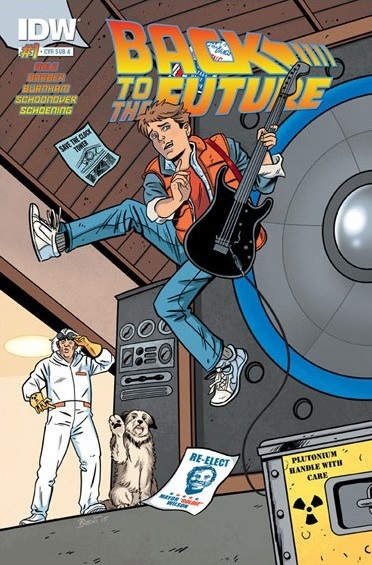 Part of a 5 issue mini-series, this first issue provides the back story of the Doc and Marty’s friendship in a sweet and entertaining way, while future issues will fill in even more details on many of the supporting characters that make the Back To The Future universe so rich. As part of the “We’re Going Back” fan event, the town of Fillmore, CA actually turned itself into the fictional city of Hill Valley for a day, transforming local shops into the famous downtown locations from the 1955 and 2015 eras seen in the films. Visitors could take rides in a DeLorean modified to travel on train tracks like in the 3rd film and coolest of all, get rigged up by a stunt team to ride a hoverboard. As if that wasn’t enough, the actor’s who played Griff Tannen’s cybernetically enhanced gang in Part 2 were there as hoverboard riding veterans to offer tips. Those were just the highlights, cosplay, memorabilia and more made this 5 day event a Back To The Future fantasy for all involved. October 21st, 2015 also marked the debut of a fun and unique podcast called SequelQuest. The premise of the show finds hosts Adam, Jeff, Justin and Jeramy conceiving sequels to popular movies, with the premier episode focusing on, you guessed it, Back To The Future. The what if scenarios for a 4th installment of the franchise led to lively discussions and kicked off the program with a bang. The hosts were thrilled to have it coincide with the Back To The Future Day events and glad to do their part for this once in a lifetime occasion. Click here to listen now.